What is the MRI Receiver’s Role? 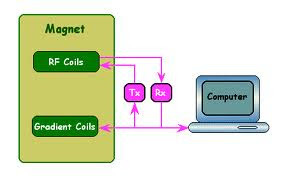 An RF MRI receiver is used to process the signals from the MRI receiver coils. Most modern MRI systems have six or more MRI receivers to process the signals from multiple coils. The signals range from approximately 1MHz to 300MHz, with the frequency range highly dependent on applied-static magnetic field strength. The bandwidth of the received signal is small, typically less than 20kHz, and dependent on the size of the gradient field. A traditional MRI receiver configuration has a low-noise amplifier followed by a mixer. The mixer combines the signal of interest to a low-frequency IF frequency for conversion by a high-resolution, low-speed, 12-bit to 16-bit analog-to-digital converter (ADC). In this receiver architecture, the ADCs used have relatively low sample rates below 1MHz. Because of the low-bandwidth requirements, ADCs with higher 1MHz to 5MHz sample rates can be used to convert multiple channels by time-multiplexing the receive channels through an analog multiplexer into a single ADC. With the introduction of higher-performance ADCs, newer MRI receiver architectures are now possible. High-input bandwidth, high-resolution 12-bit to 16-bit ADCs with samples rates up to 100MHz can also be used to directly sample the signals, thus eliminating the need for analog mixers in the receive chain. What are the Basic Elements of an MRI Receiver? The basic elements of an analog MRI receiver chain are a pre-ampliﬁer, a one- or two-staged modulator, aquadrature-phase-sensitive detector, low pass ﬁlters, two second-stage audio ampliﬁers with variable gain, and two analog-to-digital converters. As a result, the MRI receiver is very similar to a conventional superheterodyne radio receiver. When dealing with MRI scanner receivers, it is important to take a good look at the signal-to-noise ratio and the bandwidth. In general, a wider bandwidth includes more noise. Decreasing the bandwidth by a factor of 4 results in an increase in the signal-to-noise ratio by a factor of 2 (less noise in the image). the chemical shift artifact increases. longer echo time (TE) means some reduction. longer echo time means that fewer slices can be fitted into the repetition time (TR) period. In the signal-to-noise ratio however, the overall effect of the reduction of the bandwidth is an improvement in the signal-to-noise ratio. The initial bandwidth of the MRI signal produced by the MRI scanner is a function of the special encoding readout gradient strength, and the chemical shift. MedWOW, the global medical equipment portal, specializes in imaging equipment, including an impressive selection of MRI scanner receivers. Currently, there is a broad selection of MRO scanner receivers for both stationary and mobile MRI units from GE Healthcare, Siemens, Marconi, Picker and Toshiba. MedWOW’s revolutionary search engine allows you to browse their catalogue in a number of ways, so finding the MRI scanner receiver you need is a simple procedure. You can filter by manufacturer, make, model, condition, location, year manufactured, Seller’s business type and more. So, when buying or selling MRI scanner receivers, MedWOW is a good place to find a varied selection at competitive prices, as well as safe and protected transactions.